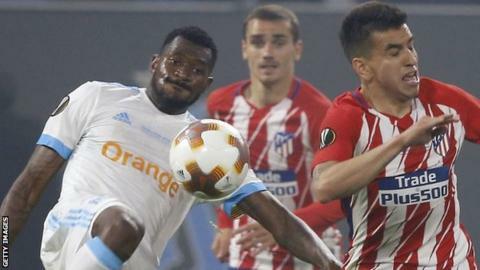 Fulham have signed Marseille midfielder Andre-Frank Zambo Anguissa in a £22.3m deal, one of five transfers the Cottagers completed on Thursday. Bristol City left-back Joe Bryan joined for £6m, with loan deals for Atletico Madrid forward Luciano Vietto, Sevilla goalkeeper Sergio Rico and Manchester United defender Timothy Fosu-Mensah. It means Fulham have been the busiest club on transfer deadline day. Zambo Anguissa’s deal is the Cottagers’ 12th signing of the summer. The 22-year-old is a Cameroon international and played 54 times in all competitions for Marseille last season, including the Europa League final, where the French club lost 3-0 to Atletico Madrid. “I’m delighted to have signed for Fulham,” said Zambo Anguissa, who has signed a five-year contract. “This is a new chapter in my career and one I’m really looking forward to. Fosu-Mensah, 20, has represented the Netherlands at senior level, Rico, 24, has played once for Spain and won the Europa League with Sevilla in 2015 and 24-year-old Vietto has played for Argentina’s Under-20s. Bryan made 48 appearances in all competitions last season for Bristol City and played in their 2018-19 Championship opener, a 2-2 draw with Nottingham Forest last Saturday. The 24-year-old was close to joining Aston Villa on Wednesday, but has opted to join Premier League newcomers Fulham. He said: “The opportunity to play in the Premier League is one you can’t turn down as you may never get it again in your lifetime. Rico, who is 6ft 5in, made more than 160 appearances during a four-year spell at Sevilla before joining Fulham on a season-long loan deal. “I’m very happy, really pleased to have signed for the oldest club in the Premier League,” said Rico. Vietto began his career at Villarreal, before joining Atletico in July 2015, but spent the second half of the 2017-18 season on loan at Valencia and scored five times in 19 games in all competitions for them. Mensah, who has made 21 appearances for Manchester United, spent last season on loan at Crystal Palace. He said: “Fulham has a lot of good players, and it’s good for my development to be here. I have a good feeling about the club. It has a nice history, it’s a nice club. Before transfer deadline day, Fulham had also signed goalkeeper Fabricio Agosto Ramirez, defenders Maxime Le Marchand and Alfie Mawson, midfielders Jean Michael Seri and Andre Schurrle and striker Aleksandar Mitrovic this summer. They have also taken defender Calum Chambers on loan from Arsenal. Fulham beat Aston Villa 1-0 to win the Championship play-off in May and begin their Premier League campaign at home against Crystal Palace on 11 August.